While working in Quincy, Paramedic Carrie Ryan recognized that a Weymouth family needed her help after their family home caught fire and they lost almost everything. With the help of the Brewster team, Carrie was able to make sure the family's two daughters had new clothes. The girls' mother said, "Carrie was an angel the day we met and because of her efforts I will be able to replace my two daughter's school clothes and their winter coats." Q: What is your current role with Brewster Ambulance Service? CC: My title is Field Supervisor for Division 2. I work closely with three other Field Supervisors for 24/7 coverage. I handle any employee concerns/issues, trying to go to the high priority calls, keep communications open with municipalities and facilities we serve, and make sure we're upholding the Brewster standard. We're in uniform, the employees look their best and perform their best. It's a challenging position. You're in charge of finding solutions for these problems. We're talking clinical issues to, "My truck broke down, what do I do?" It's great because it's a challenge and fun and all of my coworkers are amazing. It totally makes my job fun and I really like this job. In addition, I am still a full functioning paramedic. So if Braintree had all of their trucks out and we had to do a truck on our own, we could. Working as a paramedic, I'm always trying to maintain something that's positive, and that was my main goal taking this Field Supervisor position. We have so many employees and we got big so fast, people felt like they were forgotten, which is not the case. We are taking the supporting position of, "We're here, regardless of where you are, we're here to help you." Our team now has a number to call 24/7 and can get help with questions or issues they may be going through. Q: What is it about recognizing the team that you feel is important? CC: In the past we have not done enough to promote positive recognition. We have crews who do amazing things. Just recently we had a pair of paramedics in Quincy, Hugh Devlin and Rick Weitsen, along with Quincy K9 officer Dan Parisi—who arrived at the scene of a house fire before the Quincy Fire Department and went into the burning house and removed two elderly people and a young boy, and one elderly person had to be carried out. They got them out of this burning building and confirmed no one else was in the house. The people were not even aware the house was on fire. It is so important that we recognize this. Our team is out there doing these kinds of things every single day. We know people want to recognize our teams beyond our own company. For example, a facility nurse calls and they just want to say thank you to the BLS crew that brought in the patient into the nursing home. They took extra time to unpack a bag, get the blanket out of the bag, get them a pillow and ask them if they wanted a glass of water before they left. And they put an email out saying great job. Peers need to see the recognition going out. When we're recognizing the good that people do, that's what is important. It keeps them doing a good job over and over again. They feel like they are more part of a team who are creating good in the world, and having an impact. Part of the recognition doesn't have to be running into a burning building, it could be the person who stayed an extra twenty minutes to make sure their truck was spotless. That should get recognized. It's up to me to put this in my report, "Hey, we have a good one here." In the future when we're looking to promote from within, I could list off a list of names of great performers who would be perfect candidates for promotion or other opportunities. Q: How do you collect feedback and get insight into how the team wants support? CC: We'd sent out employee surveys before and got a lot of feedback, the Brewsters are good about that. The surveys told us that the team wants more supervision, more communication, and their solution was creating a job like I have and adding a bunch of people like base coordinators to help increase communication. We're going to have someone at the other end of the phone, always available and ready to help. Absenteeism is a top priority we want to improve. The problem with a company that runs 24/7, is that the person who is absent or out sick affects other team members on that shift. They have to stay late or work more. There are ways we can improve this by talking with them about chronic sick days. Maybe they're having child care issues. It could be because mom or dad has to go home, has to be there for a sick child. We lost our babysitter and I'm gonna have to be late every day. These are all examples of small scheduling issues we can work around because we want to be flexible. We have enough shifts and we can work with these people and let them know that they have an option. We need to ask, "How do we keep you and make this work for everyone?" We may be able to reduce the absenteeism by being more proactive and communicating with them, letting them know we are flexible and want to make their schedule work and still accommodate the issues that may cause them to not be able to work. We don't want to overwork the team either, so finding a good balance is in order. Q: What other types of support is needed by the team? CC: EMS is the most stressful job you can imagine. Sometimes you get burned out. Having someone on the other end of the phone to talk to you can make a big difference. Anyone can call and say, "I'm having a day. I've done four cardiac arrests in a row and I just need a moment." We're like, "Okay no problem. I have no problem and can jump on that truck for you so you can take a break and go relax." There are simple things we can do to make it better. Management is so overwhelmed, people are like, "I'm having a scheduling issue," but they don't want to bother their supervisor or manager. It's great that we have Field Supervisors to help alleviate some of that, because you can call them up and let them know that you're having an issue, and get help. We can work around people, and say, "Hey you need a day off? Okay. Maybe you can help me out with extra time next week." Little things like that help to let them know we're flexible and want to work with them. Q: Who have the important mentors been in your career? CD: I've been so lucky, I've been able to work with Chris DiBona. And he told me one piece of advice: "Always remember you work for your employees they don't work for you, and you will never go wrong." He's a smart man. If I could do half of what Chris has done, I'd be satisfied. Also, my bosses Mark Gassiararo and Scott Volz, who I've worked with for years now. They have provided me immeasurable guidance and helped me get to where I am today, and I know with both of them I have someone I can call 24/7 for anything. They have embedded in me the desire to do the same for every employee I work with. The Brewster family is also a source of inspiration. I sat in on supervisor meetings and got to know the Brewsters really well. I don't think people realize this, but the Brewsters don't want anyone to get in trouble. They don't want someone to get fired. They want to give chances, change things to work better for the team. They are the most reasonable people. It's strange I've worked other places and it's not the approach ownership usually takes. We've grown to over 1,100 people. They'll still text people back and forth. I get texts from them, Mark, GB, it's strange to see ownership this involved. It's great. But it can be challenging for the people who are not working in the same building with them, because realistically, they can't be in every place people work. But they make an extra effort to stay as connected and responsive as possible with anyone on the team. It's good to know the Brewsters are there when you need them. They want employee feedback. They want to make everything great and work with people. This is how we've gotten so big, so successful, so fast. They put the power behind it. Their attitude is that "We're going to make this the best team." They're there day in and day out making it happen. Q: How did you get on the path toward becoming a paramedic? CC: Truth be told, I went through the EMT class while I was in college, and I did it to be lazy. It was twelve credits I could get rid of fast. I took the course and LOVED IT. Got to do ride alongs with the fire department, got to see what the job was and I was hooked. Every day is something new, and now, over ten years later, still to this day no day is the same. It's interesting. It's a pretty cool feeling knowing that people are walking around this world because I helped them. My partner and I did our job. We got them to the hospital in time while they were having their heart attack. Or delivered a baby. That takes away from all of those bad days. Makes it all worth it. Q: What is it about your work ethic that makes a difference? CC: I have learned—and this has always kept me out of trouble—if you treat every patient like they are someone's daughter, son, father, mother, that they are a family member and you treat people how you want to be treated. You'll never go wrong. So we have some very trying calls. We have a large amount of overdoses, much more so than when I came to EMS. Sometimes they go smoothly and you can wake them up with Narcan and they're thankful. Sometimes they are not happy, they may scream, fight you, even the stigma around drug addiction has an impact. You have to look beyond that and say, "That could be my son or cousin." Maybe you know someone who has had that struggle. Remember that they are people, and give them respect. I've seen other EMTs outside of Brewster treat overdose patients differently. It's also important to remember that when they call us, they're having the worst day of their lives. We always see people on the worst day of their lives, and cut them some slack. We want to be helpful. Sometimes people are altered, they are upset, they are combative. We are just here to help and you have to remember that. I took this job [Field Supervisor] because I wanted to be a support to our team. I pick up the phone even on my days off. I've been where they're at. I've had clinical issues. I've had those clinical calls. I remember calling Chris at 10:00 at night with a vent challenge. It's super important to have someone to fall back on. Sometimes we're out there with just our partners, and it's easy to feel like we're all alone on a call. Even if it's just to call and vent about their crappy day, it's good! I watch people who work 80-90 hours a week every week. It's important to take time off. Let your job stay at work. Go home and enjoy your life. Rest up. The next day is a new day. I also have the benefit of a lot of support at home. I'm lucky, my husband is a Quincy firefighter, and he understands what a really bad day is. He'll say, "Okay, maybe look at it like this, I know someone died, but the next one you'll save." It's how you get through the stress. Talking to coworkers and getting support is the important part. Q: Some people may be reluctant to get help, either because they don't know how to ask, they don't think it will help or that they don't feel like they need it. What would you say to that? CC: The stigma around getting help is real. Some people have a harder time asking for help than others. Now you have someone you can come to, and a woman, which for some people may be easier, such as if you're not comfortable talking to one of the men. People need to talk things out with their partners. If you're hesitant to do something because of a bad outcome, we need to address it. We tell them, "Hey, we can go over training. I'll bring you to the training department, I'll do it myself, I could use the practice too." It's my job to check on people especially after a bad call. And I know everybody else in the Field Supervisor position feels the same way. Whether it's their day off or not, we are communicating constantly. Maybe we can check on the crews and let them know we're here, seeing if you need anything and how you're doing with this. If you're having a bad day and some hard calls, the Brewsters are great about that. We tell them, "Having a bad day? Go see your family. We'll cover." Q: Can you share a story that exemplifies the team in some way? CC: A couple months back I went to a hard call. It was an active shooter in Braintree at the Motel 6. The shooter had barricaded himself into a hotel room and shot a police officer in the face. Deb Johnson and Mike Gallagher were working in Braintree, but they couldn't get through the road to get to the officer who had been shot because they had closed the road down. All they knew is that they had an officer shot and the radio transmission was crazy. Screaming and panicked. They didn't know where the shooter was or if there was still shooting going on. They got on the radio and said, "We're gonna go right through this to get this officer, we're going to get him." They put their lives on the line to save this guy. I drove the medics to the hospital. This officer was panicked and upset, and they did a great job calming him down, and we got there within 12 minutes. It was amazing. From when we got to him, to the hospital was I'd say 15 minutes max. This guy is walking around today still a Braintree police officer. Q: What is your advice to new EMS professionals getting started? CC: I would restate, treat people how you want to be treated. Have compassion and it's literally the best and most rewarding job you could imagine. It's a great way to give back, it really is. 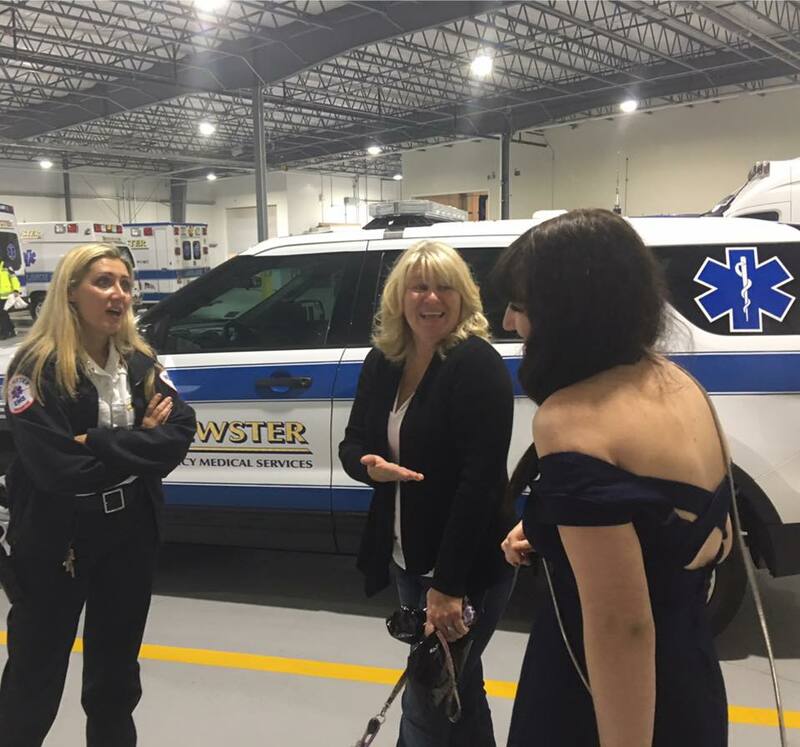 Q: What is it about Brewster Ambulance that's different from other ambulance providers? CC: They are so committed to their people. Whether it's giving a raise company wide, making sure we have the newest and best equipment, there's a personal touch with Brewster. At other companies I didn't feel like they knew my name. They remember things and it's nice. They are also very approachable. They encourage your ideas and feedback and are very receptive. They tell you all the time, "It's your company, too, your thoughts are valuable." Having job security is what everybody is looking for, and the opportunities are there for everyone. That was my major thing when I got hired. I want to give the crews the recognition and open the lines of communication. Making sure that there's communication, therefore whether it's me telling my boss, getting it up the line. Leadership is super receptive. Some of these crews working on the truck may have a great idea on something to improve and the Brewsters may not know it. So this is a great way to get that information to those who can put these great ideas into action, and it happens every day. The results are on the street and shown by how fast the company has grown.